Can Drinking Too Much Skim Milk Harm You? Nadia Nygaard has been writing and editing since 2005. She is published in "Farm and Ranch Living" and has edited projects as diverse as grant proposals, medical dissertations and tenant law handbooks. She is a graduate of the University of Washington with a Bachelor of Arts in English and women's studies. Dairy, including skim milk, can be a nutritious part of a well-rounded diet. The nutrients in skim milk support cellular growth and maintenance at most stages of life. Newborns should not drink cow's milk until about one year of age, however, because the milk does not contain a baby's required quantity and value of nutrients available in breast milk and baby formulas. Skim milk contains calcium, magnesium, zinc, lactose sugars, vitamins A and D and milk proteins. Each of these nutrients plays a vital role in the development and maintenance of good health, and should be present in adequate amounts in a well-rounded diet. 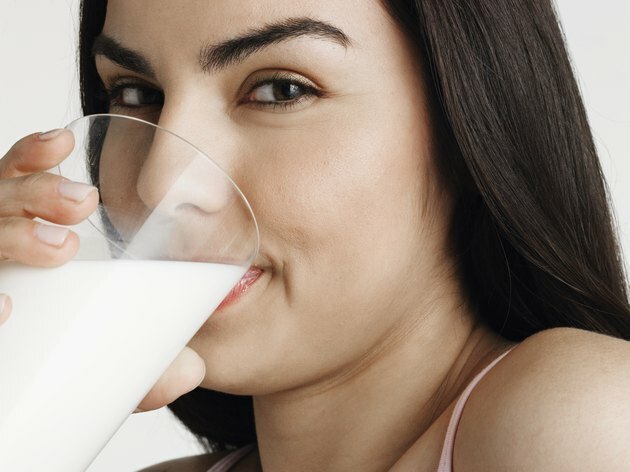 The Food and Drug Administration, FDA, sets guidelines for how much of each nutrient a body needs for optimum health; drinking skim milk can help you meet those guidelines. An abundance of milk, however, can put you over the upper limit and put you at risk for toxicity. Milk is most known as a source of calcium, the most abundant mineral in the body; it is an element essential to bone and tooth health. Teens and adults should consume between 1,000 and 1,300 mg of calcium per day. The less fat a serving of milk has, according to the National Institutes of Health Office of Dietary Supplements, the more calcium it has. An 8-oz. glass of skim milk contains 296 mg of calcium. According to the University of Maryland Medical Center, your total calcium intake should not exceed 2,500 mg per day. If skim milk was your only source of calcium, you would have to drink less than nine 8-oz. glasses of milk per day. It is likely, however, that your diet includes other sources of calcium, including fish, nuts, tofu, cereal, greens and calcium-fortified juices; all sources of calcium should be taken into consideration when figuring your total calcium consumption. Too much calcium can cause constipation and stomach upset, nausea, diarrhea, kidney toxicity and irregular heart rhythm. Those taking medications should talk with their doctor about possible drug interactions with high doses of calcium. Absorption of calcium or the medication can be affected by the mix of high levels of calcium and prescription drugs. Even though skim milk is fat-free, it still contains calories. Calories are the key factor in being both underweight and overweight. An adult should get between 2,000 and 2,500 calories per day, depending on levels of activity. Each 8-oz. glass of milk contains approximately 100 calories, or five percent of your daily caloric needs. Too many glasses of milk can put you at risk of consuming too many calories which, when mixed with the rest of your diet, can then lead to calories being stored as fat. Conversely, drinking too much milk may cause you to lose your appetite for other foods, putting you at risk of being undernourished, as milk does not contain all your essential nutrients. According to the Providence Nutrition Services and the Beverage Guidance System, you should drink no more than two 8-oz. cups of milk per day for optimum health. Providence Nutrition Services: Ask an Expert: How Many Calories Should I Drink Each Day? How Many Calories Are in a Glass of Milk? What Are the Advantages of Milk & the Differences in Whole Milk Vs. Skim Milk Vs. 2 Percent Milk? What Form of Milk Has the Most Calcium in It? How Much Milk Should Adults Drink Daily For Strong Bones? How Much Milk Should You Drink at the Age of 50 and Also Over 50?